Ah, just got done watching the documentary Babies with my mother-in-law. If I didn’t already have my little PhotoBookBaby, I seriously would have been hearing my biological clock ticking! Those babies were so adorable and seeing the cultural differences as well as similarities was so interesting and engrossing. My little guy is sound asleep after a series of short restless naps and crying all morning and afternoon. Today was a fussy day, but I think he may have finally tired himself out. Now like many mothers and fathers all over the world, I’m awaiting his cries signaling us that it’s milk time again! But I should have a little bit of time to get this post up. 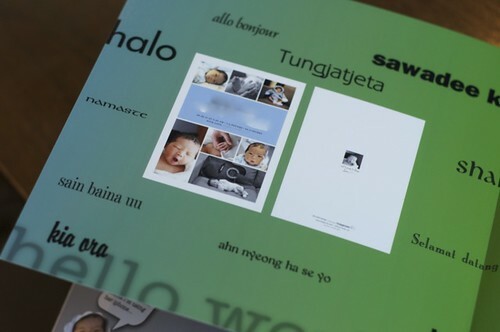 My first photo book post-birth is a baby guest book. While I was pregnant, I did a lot of searching online for a baby book, but I didn’t see anything that really caught my eye. So instead I looked at the topics and typical information that is included in baby books and took notes in preparation for making my own. 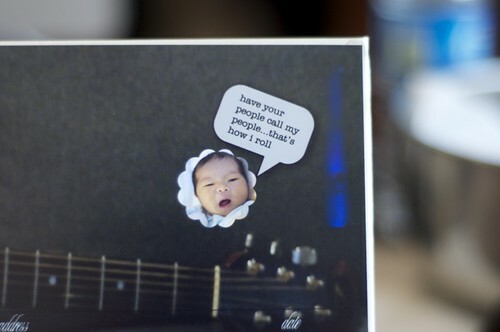 Yup, unsurprisingly, I’ve decided to make a series of custom baby books instead of buying a single book off the shelf. 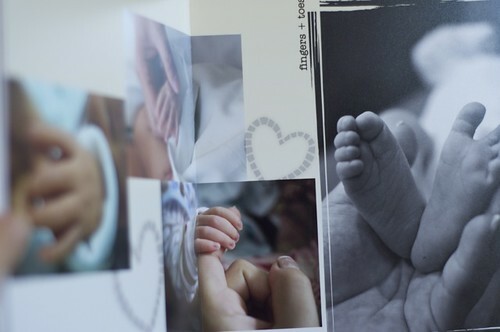 Since it was my first book with a tiny newborn in the house, I wanted to ease back into the photobook groove with a short book, and the first thing that came to mind was a photo book for visitors. In traditional baby books that you can buy online or in the store, you typically see a section for guests and visitors to sign. 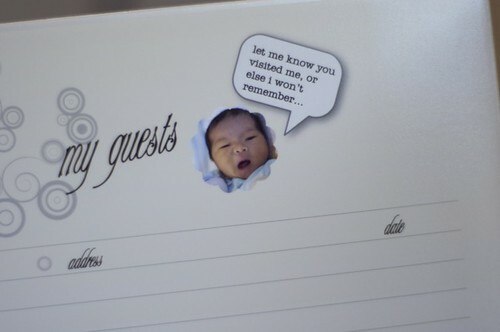 In making a custom baby guest book, the benefit is being able to add photos of my baby’s first month and other anecdotes. Granted it comes a little late for those who have already visited, but they can always sign it the next time they come! The design theme is clean lines, lightheartedness and fun. More on the design later. I decided to print up my book with AdoramaPix. They were running an awesome sale on 8×8 books starting at $8.99, but I couldn’t finish the book in time for the sale deadline. Regardless, I had an unused credit with AdoramaPix for a free 8×8 book since my husband had purchased my DSLR from Adorama last year so I applied that towards my order and that helped a bit. I also paid an extra fee to have my book order expedited since I wanted to have it in time for this weekend. It’s good to know that option is there in case I need it. If you were to look at the original price without the expedite fee, the book would cost about $46.00 with shipping. Since I’ve reviewed AdoramaPix before, I won’t go into long detail about their software, but it is one of my favorite photo book design programs out there. You have a lot of control and flexibility over the layout of the pages, you can control opacity of your photos and I like how you can extend your designs completely across the spread without losing any of your image since there’s no gutter. AdoramaPix's spreads are continuous - there's no break in the fold, so you don't lose any of your layout. You can also extend your cover image or place an entirely different image on the spine of your book as well. One thing on my wish list for AdoramaPix is to be able to use my own fonts – the fonts provided aren’t bad, but of course I would love to be able to have more flexibility. I did use a few fun masks and clip art for my project. One thing I noticed is they updated the program so it shows you what items you’ve used so you can easily find it and use it again. That was a welcome update. Check out my earlier review on my wedding photo book for more details on AdoramaPix’s software. Some time after I printed my wedding photo book with AdoramaPix last year, they discontinued the UV protection coating option and I had a couple questions from readers if there was a resulting difference in print quality. I don’t see any noticeable difference between the two books I’ve done with them, and since the UV coating was an extra cost before, I really don’t miss it. My books do not sit in open sunlight anyway, so I’m not concerned about fading. The stand out for AdoramaPix’s books is that the pages are printed on real photo paper – thus print quality is some of the best out there. 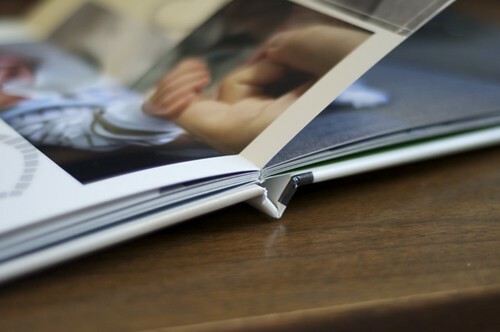 The pages are also much thicker than most photo books since the pages consist of two pages sandwiched together. Also as mentioned earlier, the fact that there is no gutter – you don’t lose any part of your layout. Bonus. I chose not to have my photos corrected as I already edited the way I wanted them to appear (that option appears at checkout). I did not chose that option with my other book either and I was happy with the way the photos printed. 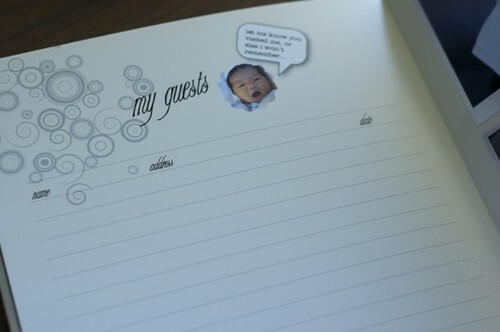 Here’s how I designed my baby guest book in case you’re interested in making one for yourself! 2) I came up with a single template for the “name, address, date of visit” portion for guests to sign. That way I could just copy and paste it into each spread. The lines were ready made under the “Sticker” tab under “page lines” (you can enter that into the search tool to make stickers easier to find). DESIGN TIP: You can select multiple elements to copy by holding down the “Shift” key and selecting the items with your mouse. That way you can copy and paste multiple items at one time to easily reuse layouts or designs. Many photo book companies’ software programs allow you to do this – it’s a time saver. 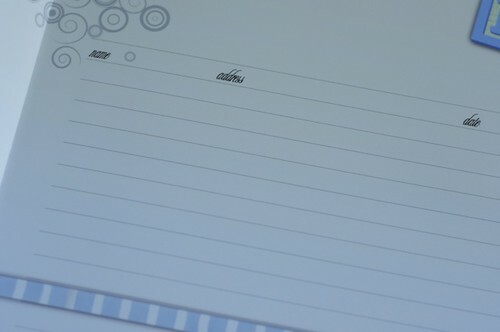 Also, look for “Copy Spread” and “Paste Spread” if you want to copy everything on the two adjoining pages. The "Headline" font is the smaller type and "Engaged" font is the cursive one. I chose a blue and green color to mix using the color gradient tool. 6) I decided to inject a little fun and after browsing through the stickers, I saw those bubble captions/speech balloons typical of comic strips. I thought why not give Photo Book Baby a voice? There you have it! Anyone else working on baby related photo books? Next up is my pregnancy journal – a project I’ve been working on for the last 10 months! Have a great weekend! I can imagine how hard it must be to meet deadlines for coupons and such after having your baby! I wish you can host a workshop or two for us newbies! 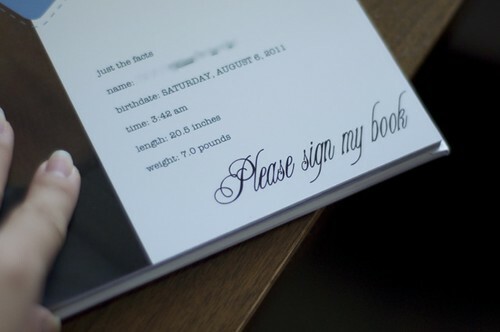 I love the guestbook idea btw. Cute book–I love the talking-bubble comments, LOL! I’m still working on the book of twin puns. I have one more picture I really want to put into it, but the pun is “twindestructible,” and honestly, whenever they destroy something I tend to be too frustrated and harried to remember to take a picture before getting it cleaned up! Thanks Mejaka – by the way, what is a “pun”? Beautiful Book!! I do LOVE Adorama Pix and wanted to comment on the photo correction they offer. I don’t usually use photo correction because I develop my photos threw lightroom and I’m happy with my results. BUT the difference of using Adorama’s photo correction is that there is an ACTUAL PERSON, lab tech looking at your photos and correcting them, unlike other sites that use a computer which makes a HUGE difference!! So if you are worried about photos being to light or dark I would allow Adorama Pix to correct your photos!! 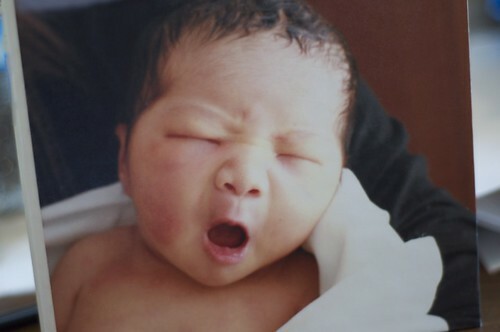 Congratulations on having Photobook Baby! He is adorable! I am working on an AdoramaPix book (my first photobook!) for my trip to Australia. It has been fun putting it together and I can’t wait to have the end result book in my hands!!! Thanks Vanessa! I love Australia – did you see my honeymoon books? We went there and to New Zealand in about two weeks and folks thought we were crazy trying to do both. We had an extreme of weather from 30s to 80s! 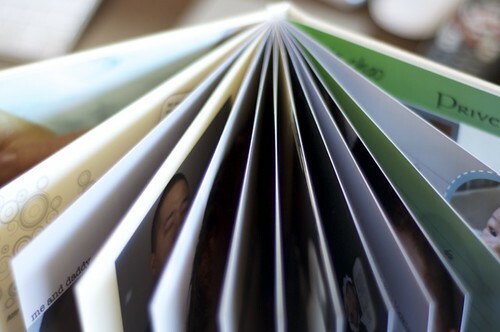 I cannot say enough wonderful things about AdoramaPix photobooks! After reading through your reviews I made my first photobook, my wedding album, with Adoramapix and it turned out beautifully. The first one I printed had a small error (barely noticeable finger print on the back cover), but when I contacted their customer service they quickly offered a free re-print and mailed me one right away. I ended up so happy I purchased additionally copies for the parents, grandparents, etc. who all raved about how gorgeous the books were. I am happy to hear that you can write on them without it smudging since I am putting together a wedding guest book for my best friend. I’m so glad you like your books! Yes, be sure to use the fine tip permanent Sharpie.